Cauliflower purée can work as a lovely backdrop for other flavors, in this case grilled shrimp. It’s low in carbs and won’t get sticky like potatoes. Marinate Shrimp: Mince 6 cloves garlic. Toss shrimp with the minced garlic and 1/4 cup olive oil, ground black pepper and a few pinches of salt. Marinate for at least an hour. Make Herb Dressing: place the two remaining cloves of garlic, parsley leaves, tarragon and 1/4 cup of olive oil in a food processor and blend until you have a bright green purée. Season with salt and pepper and lemon juice to taste. Remove purée to a bowl. Grill Shrimp: heat grill to high and place shrimp on grill. Almost as soon as you’ve laid out your shrimp, it’s time to start turning over the first ones to brown on the other side. Warm the dressing in the microwave and toss the shrimp in the dressing until lightly coated. Plate Shrimp: place about 1/3 cup of warm cauliflower purée in the center of each plate. Pile about 5 shrimp in the center of the purée. Scatter each plate with pomegranate seeds, pine nuts and currants. This dish could easily be done with puréed fennel instead of cauliflower. In that event, I’d slice the fennel really thin and cook it gently in a covered sauté pan with a few tablespoons of water until tender. Purée it and add olive oil, salt, pepper, lemon juice and a little Pastis to taste. Omit the tarragon in the herb dressing. The first time I ate Artichoke a La Barigoule I was in Chartres visiting a friend and it was she who made it for me. Sandra was a wonderful cook but definitely ” a pinch of this” and “a handful of that” kind of femme. I have acquired many recipes from her, for example, courgettes stuffed with cheese and Neapolitan style tomato sauce but it always entails watching her cook and rapidly writing everything down because Sandra has everything in her head and she moves fast. Sadly, I didn’t watch Sandra prepare this dish. How was I to know that I should have been taking notes instead of chatting over a glass of wine? So, after my usual perusal of recipes on the internet and my memories of Sandra’s dish, I came up with a recipe I can share with you. It’s equally good the next day at room temperature. Please picture yourself in a house built of round stones, mortared into a two story cottage. You are seated at a rustic oak table, with your feet on a cool flagstone floor and an oak fire throwing heat into the room. It is September and the fields outside the window are golden. A subtle perfume enters the dining area from bouquets of lavender and thyme that Sandra has bundled and hung from the ceiling. Your plate of Artichoke Barigoule sits in a shallow bowl in front of you with some crusty bread and a glass of the wine you used to braise the artichokes. 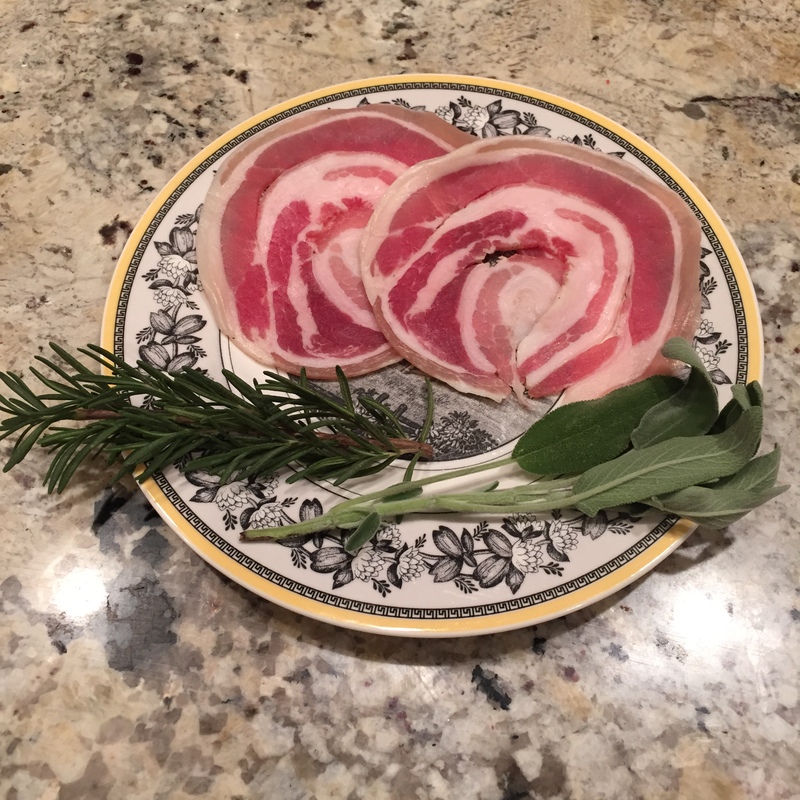 3/4 lb cooked, uncured, unsmoked ham, (Fra Mani plain or rosemary, Virginia ham or country ham), cut about two inches thick. Cut ham into bite size chunks and set aside. Trim artichokes down to the hearts, cut in half and place in acidulated water (lemon) as soon as they are cut. I like to use a serrated knife to cut off the tips of the artichoke and a paring knife to cut out the choke and trim the outside of the heart. You can see in the photo below, starting from the top down, the progression of the prepared hearts, the finished one at the bottom. In this instance, larger artichokes are better because you end up with bigger hearts. These were on the small size. Sauté shallots and celery in olive oil until translucent but not brown. Deglaze pan with wine and let it reduce to half. Cut carrots, artichokes and potatoes so they are about the same thickness, so they all cook for the same amount of time. Add Carrots, thyme, bay leaves, artichoke hearts, potatoes, peppercorns and enough water to come about half way up to the veggies. Season lightly with salt and bring to a simmer. Cover pan and simmer for about 30 minutes until vegetables are tender. Place ham in vegetables and heat until warmed through. My husband and I love to travel and one of our favorite places is Italy. One year we had the good fortune to stay with a friend of my mother in law in Volterra, famous for its alabaster. Ido graciously lent us his home and moved in with his daughter for the week. Ido’s home was set in the Tuscan hill side amid peach and olive trees, grape vines and an assortment of vegetables. The house was rustic with terra-cotta colored plaster walls and tile floors. I distinctly remember chasing spiders out of the shower. All the beds in the house were cast iron with metal springs. The dining room table was composed of several planks of wood pegged and doweled together and it was surrounded by tippy little chairs with rush seats. However, we rarely ate in the dining room. There was a little patio on the East side of the house where we took our breakfast and in the evening we went to the patio on the West side of the house and had dinner, watching the sun set and eating Edo’s fresh peaches, soaked in his home made Chianti with a little sugar and lemon juice. Every day Ido would drop buy bearing a small gift: some potatoes he’d just dug up, those amazing peaches with skin so thin and crisp and flesh so sweet and juicy that it was like biting into a Creme Brûlée with the crack of the sugar and then the unctuous silky cream. Ido made his own wine, olive oil and peach preserves. The peach preserves were lovely and had a distinctive flavor I had not tasted before. I sat him down one day and asked him to reveal the secret of the preserves. “Well”, he said. “I macerate the peaches in sugar and lemon juice overnight. Then I put everything in a big pot and boil it until it thickens. Unfortunately, I’m usually doing several things at the same time and it usually burns. But, I just scrape it up and put it in jars”. So, what was the secret of Ido’s peach preserves? He burnt it and what I was tasting was caramelized sugar. Ido spoke a bit of French but often mixed it with Italian, creating new words and phrases. For example, he would often say” Va bien” in response to our query, “ How are you”. In Italian one would respond “ Va bene ” and in French one would respond “ Ca va bien”, thus Ido created the new phrase “ Va bien” which we still use with great affection when we speak of him and the enchanted week we spent in his home. The recipe I’m going to give you is not from Ido, but it is from Lucca, not to far from Volterra and certainly in the style of Ido: excellent ingredients prepared simply. Dinner was served in the garden of a farmhouse which was up a winding rode in the hills of Tuscany. I remember two items from the meal. One was an appetizer of thinly sliced pieces of Lardo. The other a lovely carpaccio of beef. I had never seen carpaccio of beef done with anything other than raw meat so I was happy to see that this was cooked, rare but not mooing. I buy my eye of round at Whole Foods in the deli department. They usually have a nice rare piece and are very happy to slice it. Ask them to slice overlapping pieces onto wax paper and when they have filled up one sheet, put another piece on top and repeat, filling that sheet with overlapping slices. This way, the slices of meat don’t all stick together. Dress the arugula with 2 tablespoons of olive oil, the vinegar and a pinch of sea salt. Arrange 1/4 of the slices around the edge of the plate, leaving the inside empty. Place a handful of arugula in the center of the plate. With a vegetable peeler, peel large pieces of cheese over the arugula. Sprinkle the meat with some grindings of pepper and drizzle with the rest of the olive oil. This is one of the simplest chickens I do and one of the best. It comes from the Cookbook ” The Scent of Orange Blossoms” authored by Kitty Morse and Danielle Mamane. 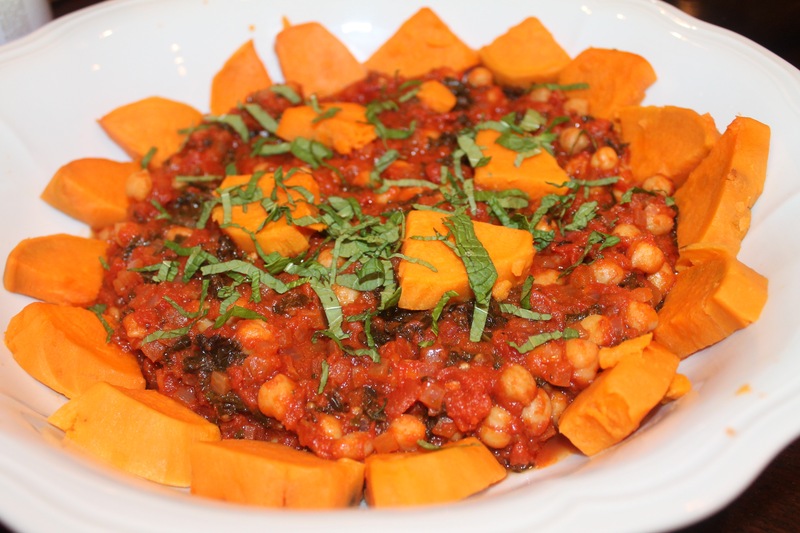 I first made this recipe when I was 13 years old for a project comparing Sephardic and Ashkenazy cooking. I have used it so often since then that the book opens up right to the recipe. 2. 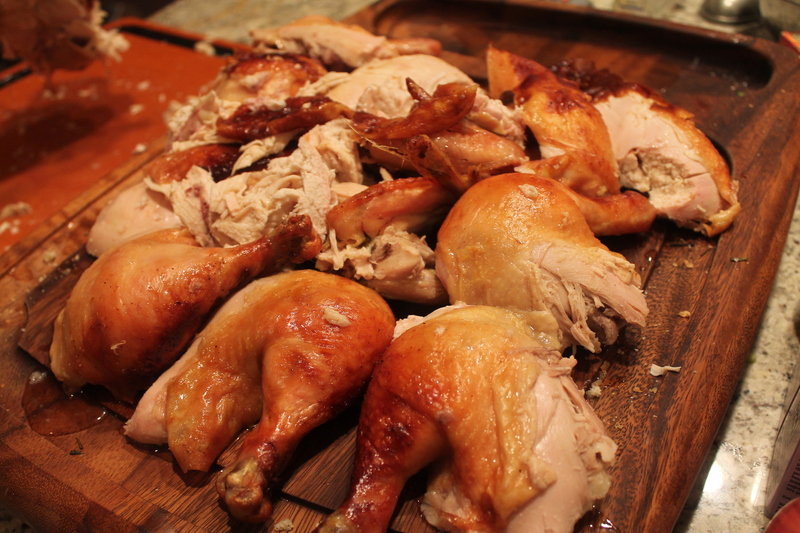 Clean the chicken and pat dry then place in a roasting pan. 3. Salt and pepper the cavity of the chicken. 4. Mix the orange juice with the bouillon. 5. Spoon half of the juice mixture over the chicken and into the cavity and put the orange in the cavity. 6. Roast for 2 hours, basting with remaining juice and pan juices frequently, or until the legs move loosely and freely and the skin is browned. 7. Take the pan juices from the chicken and reduce them for about 10 minutes. Serve the chicken with a large spoonful of pan juices. The first time I had this dish was with my son Daniel. We were on a week long eating and walking tour of NYC. Daniel and I had both researched restaurants and pastry shops but one of the best meals we had, which was not on our list, was at Vinateria in Harlem. I ordered an amazing whole grilled Branzino and the young daughter of our friends had meatballs on a bed of Polenta. She gave me a bite and I dreamt about them for the next two days: tender little meatballs the size of a walnut on a creamy, cheesey bed of polenta with a bright tomatoe sauce. We went back the night before we left and when I returned home I vowed to recreate them as best I could. So, here is my version and I think it’s pretty close, but it will never replace the meal I had at this neighborhood bistro with my son, my childhood friend, her lovely husband and charming daughter. Many of these components can be made ahead of time. The sauce can be made in advance and frozen. 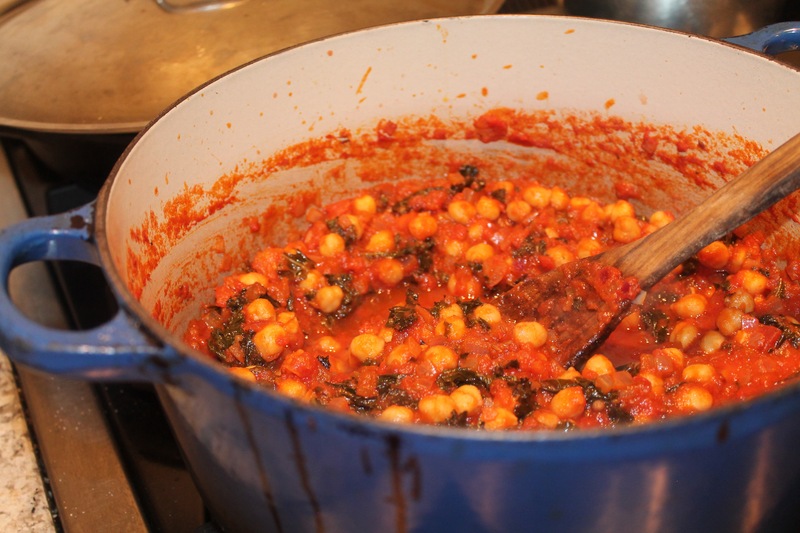 I make a lot of this sauce in August when the tomatoes are at their peak and I can use locally grown Roma tomatoes. You will not get the same result with supermarket tomatoes. The meatballs can be mixed and shaped a day ahead of time and then rolled in flour and fried the day you want to serve. The meatballs can also be mixed, shaped fried and placed in the tomato sauce a day or two ahead. I think they actually improve with a 24 hour rest in the sauce. I have also frozen the meatnalls cooked and in sauce. They defrost quite well. 5 Tablespoons of european style or cultured butter. I like Kerry gold but President, and Organic Valley Cultured butter are also good. You can use Land O Lakes or a store brand butter but the result will not be as good. Wash tomatoes and cut them in half. Remove skin from onion but leave the onion half whole and still attached to the stem. Melt the butter in a wide shallow pan, like a sautee pan. Add the tomatoes and onion and cook, uncovered until the butter floats to the top and the tomatoes are soft and falling apart, about 1 hour. Remove the onions and peel,the skin off the tomatoes. Pass the tomatoes through a food mill, using the disc with the largest wholes. Remove Ricotta from it’s tin and spread it out to be about 2″ thick on a paper towel. Place another paper towel on top and gently pat it on the ricotta. When there paper towels become wet, change the paper towels. This removes some moisture from the cheese. Do this a few more times until you’re not getting a lot of moisture. You can also place the cheese in a sieve, place it over a bowl and let it sit overnight in your fridge. Make sure you cover the cheese with Sara wrap so it doesn’t pick up odors from the refrigerator. For a more delicate meat ball mix together ricotta, egg, veal, parmesan, minced parsley, salt and pepper and mix with your hands until completely homogenized. For a sturdier meatball you can throw the ingredients in a kitchen aid and let it mix on low for about 5 minutes, with the flat beater. Test the seasoning by making a tiny patty and frying it in olive oil. Adjust seasoning as necessary. You can add up to a teaspoon more salt, and a few more tablespoons of cheese, although be aware that there is Parmesan cheese in the polenta. Take an ice cream scoop that holds approximately 2 tablespoons, scoop out a level scoop, roll it between the palms of your hand until it’s round and put it on a tray. Do this with the rest of the meat. Let chill 1 hour. Roll each meatball in flour and fry in 1.5″ of oil until all the sides are brown. Don’t crowd the pan. Do the browning in several batches, changing the oil if it gets too floury or dark. I like to use 50/50 canola oil and olive oil because canola oil has a higher smoking point and keeps the olive oil from burning. When the meatballs are done put them in the sauce and let them hang out until you are ready to use them. Bring water and salt to a boil. Slowly pour polenta in with one hand while wisking with the other. Many suggest making a fist around a handful of the polenta and letting it fall through your fingers. I find that awkward. I just put some in a beakered measuring cup and pour slowly. You should be pouring so slowly you can see individual grains. Stir for two minutes. Now, at this point you can stand over the pot and stir for forth minutes or you can follow an alternative technique as follows. Adjust the heat so it is at a simmer and cover the pot. Cook 10 minutes then uncover the pot and stir for one minute. Continue this sequence of cooking covered for 10 minutes and stirring for one minute until 40 minutes have elapsed. It should be a soft creamy mass. If it’s not, let it cook for a few more minutes covered. Add two tablespoons of unsalted butter butter and a bit of grated Parmesan cheese to the polenta. Use immediately. Some feel that you get the best texture from constant,y stirring but I use the alternative method and am very happy with it. Place a ladlefull of polenta into a shallow rimmed soup bowl or a flat plate. Add some tomatoe sauce and a few Meatballs. Garnish with basil. Once you’ve plated everything pour the rest of the polenta onto clean cutting board and let cool. The next day you can make polenta fingers by cutting the polenta, rolling them in cornmeal and frying them in 50/50 canola and olive oil. Sprinkle them with Parmesan cheese. At the young age of 18 my grandmother left home. She was unable to cook despite living in an Italian household. She realized that she didn’t have her mother to make her delicious Italian meals so she decided to teach herself how to cook. Now 60 years later she is one of the best cooks I know. She learned all of the basics of Northern Italian cooking form by Marcella Hazan and Giuliano Bugiali as well as her mother. 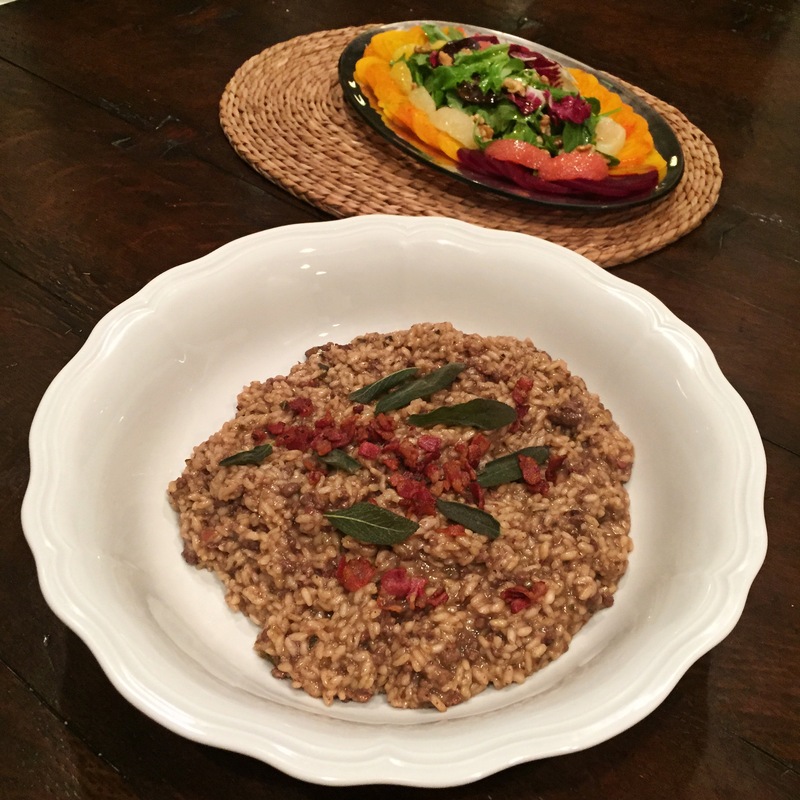 One of her signature dishes is risotto and whenever I eat this classic Italian rice dish it reminds me of her and what real Italian cuisine is. This authentic risotto recipe comes from Marcella Hazan. Risotto is an Italian rice dish where liquid is slowly added to the rice allowing it to release starch to create a creamy consistency. Risotto is the epitome of Italian comfort food; it has that decadent stick to your ribs flavor and consistency. It’s also one of those “kitchen sink” recipes , because you can put anything in it. I’ve made mushroom, sausage, and seafood risotto, but my favorite is this beef risotto. This risotto gets its flavor from pancetta (italian bacon), rosemary, sage, and good italian red wine. People often think of risotto as something that is very difficult and only available at high end restaurants. It’s interesting how in it’s transition from Italy to America, risotto went from a homey comfort food to a glamorous dish served for $30 a plate. The truth is that risotto is very easy to make, it just requires good ingredients and a lot of babysitting of the dish. The risotto basics you need to know to make a good risotto are that it starts with caramelized onions and garlic then the rice is coated in oil and small amounts of liquid are added at a time while constantly stirring the rice. The constant stirring and slowly adding in liquid are where most people take mistakes, because they aren’t being patient. Risotto is a dish where lots of love needs to be added. Making risotto is definitely an arm workout, but the reward of a good risotto is well worth the 30 minutes of constantly watching over the risotto. A risotto dinner is always something to look forward too, but I’ve found the next day is even more exciting. I always save about ⅓ to ¼ of the risotto and stick it in the fridge overnight. The next day for dinner, I like to make arancini. 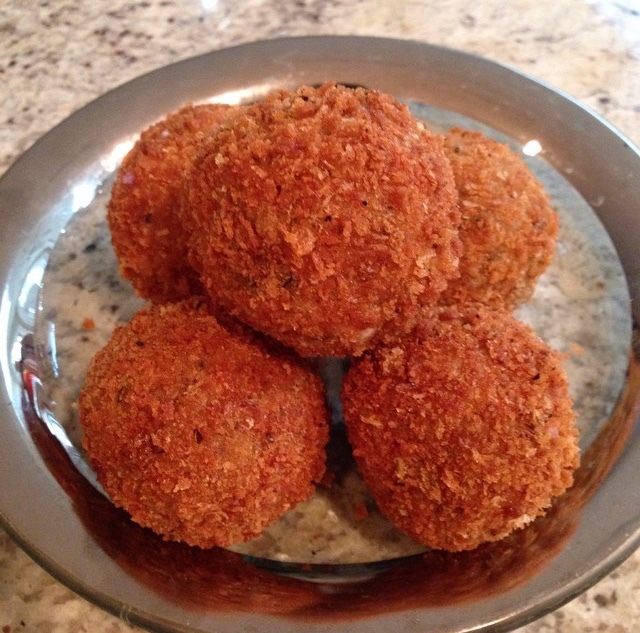 Arancini are fried balls of risotto with a gooey cheese center. Arancini have a crispy outside with a creamy risotto filling and gooey cheese at the center, what could be better? In a large wide pot heat 2 tablespoons butter, 2 tablespoons olive oil, pancetta, and onions over medium heat. When pancetta starts to brown and get crispy and onions are starting to caramelize add in garlic and herbs and cook for another minute. Add in ground meat and brown. When meat is browned add in wine and cook down until it is reduced to a thin film on the bottom of the pan. Add in rice and stir coating the rice evenly. Add in ½ cup of broth and stir. When the broth has evaporated add in 2/3 of a ladle of broth and continue stirring. When the ladle of broth has evaporated add in a generous 1/2 ladle of broth and keep stirring. ProTip: Risotto requires constant stirring and babysitting. Continue cooking slowly adding in ladles of broth as they evaporate and stirring constantly. ProTip: Drag your spoon across the bottom of the pan and if the risotto doesn’t fall back into place to fill the pan it is time to add more broth. Cook until the rice is done but still firm, and the starches have slowly released creating a creamy risotto, about 25 minutes. Add in a final ladle of broth along with 1 tablespoon butter and 2 tablespoons olive oil. Salt and pepper to taste and serve with fried sliced pancetta, fried sage leaves and olive oil. Heat a deep fryer to 375. Scoop and roll chilled risotto into golf ball sized balls with a small piece of cheese in the middle. ProTip: Use a cheese that melts like fontina. Set up a fry station with a bowl of egg-wash and a bowl of panko breadcrumbs. Roll balls through egg wash first then coat with panko and deep fry until golden brown. Salt as soon a the arancini are out of the oil and enjoy.